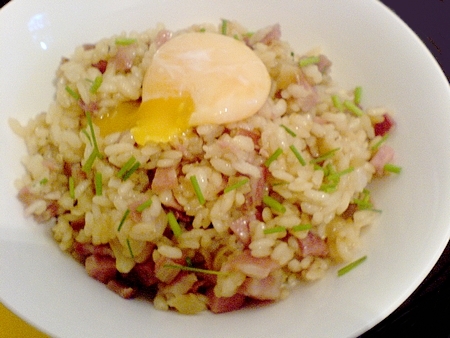 Yonks ago I thought about doing a bacon and egg risotto but forgot all about it, then the other day saw just that over at the more-ish Last Night's Dinner. 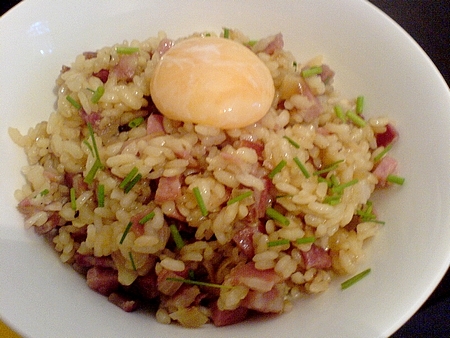 My idea had been to fry an egg until the edges were crispy and serve that over the risotto, but the original idea from An Obsession With Food was to poach the egg yolk, and I had to try it. I forgot to saute the pancetta first (I was probably too busy scoffing it on it's own) but added it towards the end, when there was hardly any stock left and could easily fry it, the oil coating the rice deliciously. Going back to look at the recipe now, I see we've served it the same with lots of chopped chives and also pancetta instead of bacon. Perfect packing-with-SATC-on-in-the-background comfort food. i love this post. looks sooooooooo yummy. This is BRILLIANT. My husband loves bacon more than any person I've ever met before. I have to try this for him.